Body of a man discovered in Shalford Park. We were called to Shalford Park, Shalford Road, near Guildford shortly after 7am this morning (13 April), after a member of the public discovered a man's body. His death is not thought to be suspicious. His next of kin have been informed. A property in Ashford was granted a Partial Closure Order by Staines Magistrate’s Court this morning (Friday, 12 April 2019). Were you travelling on the 100 bus between Redhill and Horley at around 3.25pm on Thursday, 4 April? Or perhaps you drove that route and have dash cam footage? We are appealing for help to trace a vulnerable missing man from Dorking who was last seen this morning (11 April).A 35-year-old man from Dorking who went missing earlier today (11 April), has been found. A multi-million pound government investment means every police force in England and Wales now has a dedicated cyber crime unit (CCU) in place to tackle one of the most complex policing challenges, it was announced today. Have you seen wanted man Jason Sufi? We are appealing for help to trace a man wanted on recall to prison following a burglary in Epsom last week. 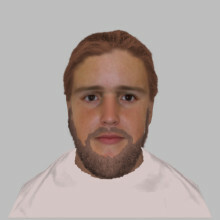 Surrey Police has released an e-fit of a man they would like to speak to in connection with three incidents of indecent exposure that have taken place in Hinchley Wood and Long Ditton. We are reappealing for help to trace a Staines man wanted on recall to prison. Daniel Griffiths is wanted on recall to prison for breaching the strict conditions of his licence. The 38-year-old has links to Staines. We’re appealing for witnesses to come forward following a robbery on Sunday 7 April in Epsom. Three teenagers approached a 14 year old boy in a small alleyway on Oaks Square between Blacks Burgers and Gummersall’s Solicitors (opposite the Co-Op) on Waterloo Road at around 7pm before threatening him and taking his mobile phone. ​A man’s been charged after being arrested on suspicion of burglary on Mayfield Road in Weybridge on Saturday (6 April). Can you help us identify the person in this image? We would like to speak to them after they were seen approaching a property in Green Lanes, Epsom at around 8.50pm on 21 March. ​A London man has been sentenced after officers on a proactive drugs operation stopped him in Dorking back in October. On Wednesday, 10 October 2018, officers from our Op Viking county lines drugs team stopped Tyreke Sharpe, 19, of Brixton in London, as he matched the description of a man who was believed to have been involved in the supply of drugs in East Surrey. ​A man has pleaded guilty to causing unnecessary suffering to an animal after officers seized a horse from a field in Chertsey in May 2018. We are appealing for witnesses after a six-year-old girl was badly bitten by a dog at a Toby Carvery in Ewell on Sunday afternoon (7 April). ​Yesterday (Monday 8 April), the Independent Office for Police Conduct (IOPC) launched a national campaign, ‘Make Yourself Heard’, to raise awareness of a system to help people alert police when in imminent danger but unable to speak. We are giving Surrey residents advice to make them aware of what happens when contact centre staff receive a 999 call, and 55 is pressed. We are currently dealing with a collision which occurred earlier today (9 April), in Caterham. Officers were called to Grange Road at around 9.55am following the incident involving a van and a pedestrian. Serious collision in Leatherhead - can you help? ​We were called following reports of a collision around 10am today (9 April), in Kingston Road, Leatherhead. ​Have you been offered this jewellery for sale? We’re asking members of the public to come forward if they have seen or been offered any of the jewellery described below following a burglary in West Molesey at the end of March. Two people have been charged after being arrested for possession with intent to supply class A and B drugs, and failing to stop for officers in Lockfield Drive, Woking, on Saturday (6 April). We are appealing for witnesses after a single vehicle collided with a tree on the A24 in Dorking on Saturday evening (6 April).